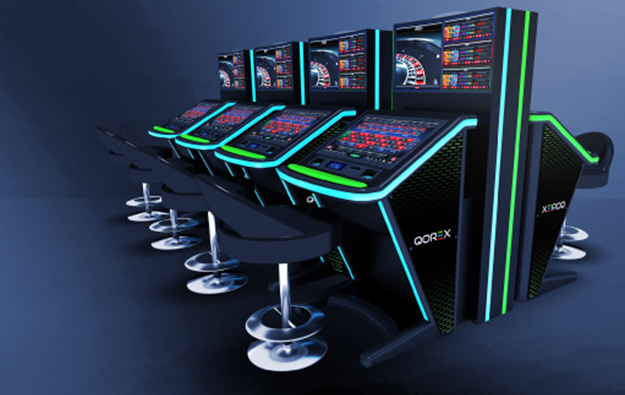 Gaming equipment supplier TCS John Huxley Ltd is to use technology provided by Japan Cash Machine Co Ltd – also known as JCM global – in its new Qorex line of electronic gaming terminals (pictured in an artist’s rendering). TCS John Huxley will equip its new terminals with JCM Gobal’s iVizion bill validator and Gen2 U thermal printer, stated a press release from JCM Global. The new Qorex terminal – featuring a 27-inch high-definition display – is a modular product: installations can be configured to the requirements of each casino operator, from as little as one electronic gaming terminal to large scale stadium-style arrangements, according to TCS John Huxley. The line is available in dealer-assisted and automated formats, for roulette and baccarat. TCS John Huxley plans to introduce to Asian customers its new Qorex terminal at the upcoming Global Gaming Expo (G2E) Asia. The event takes place between May 16 and May 18 at the Venetian Macao casino resort. “We are very pleased that TCS John Huxley has chosen JCM Global’s iVizion and Gen2 U products for their new Qorex electronic gaming terminal,” JCM Global’s general manager for Europe, the Middle East and Africa, Payam Zadeh, was quoted as saying in the release.